Sony SEL2470GM FE 24-70mm F2.8 GM Standard Zoom Lens – Black for (ALC-SH141). Condition is New. Shipped with USPS Priority Mail. Featuring a constant f/2.8 maximum aperture, this lens maintains consistent performance throughout the zoom range and benefits working in low-light conditions and with selective focus techniques. Sony FE 16-35mm f/2.8 GM Lens ( 2 available ). Works Great, have taken multiple great shots with it and well taken care of. Selling a good condition sony fe 24-70 f2.8 gmaster. Small scratch on front glass but doesnt affect photos. No box included. Trending at $1,700.00eBay determines this price through a machine learned model of the product's sale prices within the last 90 days. Glass is perfect, body has no scratches, marks, or blemishes. Featuring a constant f/2.8 maximum aperture, this lens maintains consistent performance throughout the zoom range and benefits working in low-light conditions and with selective focus techniques. Beyond the attributes of the lens system itself, this 24-70mm is also characterized by a Direct Drive SSM (Super Sonic wave Motor) system that provides fast, quiet AF performance as well as responsive manual focus handling. Autofocus Yes. The product may or may not include the original manual, but access to an English product manual should be available via the internet. Import models may not be eligible for services from the manufacturer or its affiliates. USED/WORKS 100%. THERE ARE LITTLE TO NO SCRATCHES ON THE LENS OR ON THE BODY. THE BOX HAS LITTLE SIGNS OF STORAGE AS WELL.SEE PHOTOS FOR FURTHER DETAILS. OEM LENS DUST BAG. OEM SONY BOX. • Professional Service. Trending at $658.00eBay determines this price through a machine learned model of the product's sale prices within the last 90 days. In like-new condition. Includes all accessories, just without the original box. SpecificationsFocal Length 24 - 70mm. Camcorder Kits (Body \ Lens). Featuring a constant f/2.8 maximum aperture, this lens maintains consistent performance throughout the zoom range and benefits working in low-light conditions and with selective focus techniques. Sony SEL2470GM FE 24-70mm F/2.8 GM Zoom Lens. All ring actions are very smooth. lens pouch & strap. This lens is in like new condition. The lens is in perfect working condition. The glass is free of haze, fungus, separation and scratches. The focus and zoom are smooth and accurate. The aperture blades are free of oil. All of the electronics are working as they should. Sony FE 24-70mm f/2.8 GM Lens. - AF/MF Switch; Zoom Lock Switch. - Lens Hood. - 82mm Front Lens Cap. - Rear Lens Cap. - Lens Case. - Direct Drive Super Sonic Wave AF Motor. - Aperture Range: f/2.8 to f/22. MFR# SEL2470Z. Sony Vario-Tessar T FE 24-70mm f/4 ZA OSS Lens. A constant f/4 aperture makes operation smooth and consistent throughout the zoom range. The lens is fast to focus as well due to the linear autofocus motor and an internal focus design. Featuring a constant f/2.8 maximum aperture, this lens maintains consistent performance throughout the zoom range and benefits working in low-light conditions and with selective focus techniques. Sony FE 24-70mm f/2.8 GM Lens. No scratch or visible wear upon close examination. Below is the info from the service contract regarding Transferability. The manufacturer's warranty may not be transferrable. A constant f/4 aperture makes operation smooth and consistent throughout the zoom range. The lens is fast to focus as well due to the linear autofocus motor and an internal focus design. A linear autofocus motor and internal focus design provide quick and precise autofocus performance and enables accurate and silent focusing while recording videos. Featuring a constant f/2.8 maximum aperture, this lens maintains consistent performance throughout the zoom range and benefits working in low-light conditions and with selective focus techniques. Sony SEL2470GM FE 24-70mm F2.8 GM Standard Zoom Lens – Black for (ALC-SH141). Condition is used. Absolutely excellent condition. Pictured are two tiny scratches on the body of the lens. Does not affect how the lens functions at all. I purchased this from Tempe Camera in Arizona which is a Authorized Sony Dealer. Blank USA warranty card is provided. Includes all original items. Box, lens hood, etc. Used it for about a month and realized I use other lens in my kit more and don’t really need this one. If you have any other questions feel free to message me! Tessar concept enables the lens design to be compact while maintaining high image quality and sharpness. Sony SEL2470Z Vario-Tessar T FE 24-70mm F4 ZA OSS Lens. The first number is the size that screws into the lense, the second number is the filter size. Sony FE 24-70mm F/2.8 GM Lens. Sony Lens Hood. Sony Lens Case. USA Product - Authorized Sony USA Dealer - USA Warranty. Sony USA Warranty. Tessar concept enables the lens design to be compact while maintaining high image quality and sharpness. Sony Vario-Tessar T FE 24-70mm f/4 ZA OSS Lens. The mid-range zoom 24-70mm lens covers wide-angle to portrait-length perspectives and features a constant f/4 maximum aperture for consistent performance throughout the zoom range. Front Lens Cap,Rear Lens Cap,Lens Hood,Lens Case,Limited 1-Year Warranty. The T (T-star) coating contributes to typically outstanding Carl Zeiss image quality, with high contrast and uniformly excellent resolution right out to the image edges. Near new condition, lightly used for 6 months. Up for sale is like new Sony G-Series 24-70 mm F/2.8 GM Lens. Bought this lens along with 16& 35mm & 70- 200 GM lens from B&H. This lens & 70 -200 lens are practically NEW lens never used outdoor or out side my room. A constant f/4 aperture makes operation smooth and consistent throughout the zoom range. The lens is fast to focus as well due to the linear autofocus motor and an internal focus design. Sony Vario-Tessar T FE 24-70mm f/4 ZA OSS Lens. FE 24-70mm f/2.8 GM Lens for Sony E - Mount SEL2470GM. Featuring a constant f/2.8 maximum aperture, this lens maintains consistent performance throughout the zoom range and benefits working in low-light conditions and with selective focus techniques. 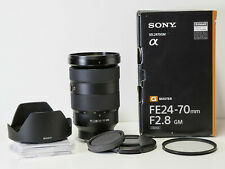 Sony SEL2470GM FE 24-70mm F2.8 GM Lens w/ Hood. Includes lens cap/cover and sony ALC-SH141 hood. Mint condition. You should not use this information as self-diagnosis or for treating a health problem or disease. Sony SEL2470Z Vario-Tessar T FE 24-70mm F4 ZA OSS Lens. Autofocus : Yes. Focal Length : 24 - 70mm. Minimum Focus Distance : 1.31' (40 cm). In Holding in your local custom. -Carl Zeiss T Anti-Reflective Coating. Mount type Sony E-mount (FE). Lens type Standard. International Warranty. It may take longer than usual for us to get back to you or dispatch your orders. Tessar concept enables the lens design to be compact while maintaining high image quality and sharpness. Sony Vario-Tessar T FE 24-70mm f/4 ZA OSS Lens. Linear Autofocus Motor; Internal Focus. Focal Length 24 - 70mm. For SONY e-mount. Canada, South East Asia and Asia. Condition : Very Good. USA, Canada. Autofocus : Yes. Focal Length : 24 - 70mm. -Zoom Lock Switch. Magnification : 0.24x. 2018 Best Partner award. -Aperture Range: f/2.8 to f/22. -Internal Focus; Focus Hold Button. -Direct Drive SSM Focus System. New ListingSony FE 24-70mm f2.8 G Master lens, A9, A7R III A7S, EX +++ condition!